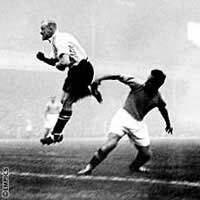 On November the 14th 1934 Italy played England at Highbury, Arsenal’s ground, in a ‘friendly’. So inappropriate was that title that the match became known as the ‘Battle of Highbury’. Italy were the reigning World Champions although it would be more true to say that they were the winners of a recent competition called the World Cup. In those days, the sides from the British Islands did not affiliate to FIFA, who had started the World Cup as a competition for professional players because, although the Olympics provided a best-in-the-world contest, only amateurs could compete. England remained on the sidelines because of disagreements regarding the status and treatment of amateurs and professionals. They also assumed they would win easily and therefore there was no point in competing. The Scottish, Welsh and Northern Irish teams followed suit and, after all, they already had their own contest with the English in the form of the annual Home Championship. In England the match against Italy was treated as a proper decider for the best team in the world, and in Italy too, there was great importance ascribed to the match as Mussolini is reputed to have promised an Alfa Romeo and £150 as a winning bonus for every player. The FA’s Selection Committee had taken seven players from the Arsenal side, as the pool of players they had to choose from had limited international experience and picking a nucleus that played together for one club would lend coherence. Seven players starting from one club team had only happened twice before and on both occasions the team was Corinthians and the opposition Wales, in 1894 and 1895. One of the Arsenal players, Edris ‘Eddie’ Hapgood, was appointed captain for the first time, and one of the four non-Arsenal players was a certain Stanley Matthews. In contrast the Italian team were coached and selected by one man, Vittorio Pozzo, a tactical genius who promoted a solid defence from which to launch incisive attacks. They had hosted and won the World Cup in a dour final against Czechoslovakia where Luis Monti had bizarrely become the first player to win a World Cup final medal for two different countries, as he’d played for losing finalists Argentina, his native country, in the 1930 tournament. The Italian team was largely the one that had lifted the World Cup, with two other South American ‘oriundi’ or ‘foreign-born nationals’, Raymundo Orsi and Enrico Guaita. Rain was lashing through the thick fog as the game kicked off and immediately England won a penalty which was saved by the Italian keeper, Ceresoli. In the second minute, Monti clashed with Ted Drake, the England centre forward, resulting in a broken bone in Monti’s foot. This being before the days of substitutions, the azzuri had to play on with ten men, and, presumably suspecting that the injury had been deliberate, began to set about the English team (Drake always protested that it wasn’t intentional). England made the best of the advantage; in only the third minute, Eric Brook, who had just failed from the penalty spot, atoned by heading one in and adding a second in the tenth minute, from a free kick. Then Drake, the Arsenal legend making his England debut, scored a third two minutes after that. But the toll on England was heavy, Hapgood suffering a broken nose and having to leave the field for fifteen minutes, Drake sporting two black eyes and a gouged leg and Eric Brook’s arm broken, not to mention the many other more minor injuries. It was an almost completely different match in the second half as the rain got heavier, literally pouring down. The English were patched up as best they could be but the Italians came out with less violence and more purpose and footballing intent. Their centre forward, Giuseppe “Peppino” Meazza began to take control, eventually scoring in the 58th minute, again five minutes later, then hitting the crossbar. The Arsenal goalkeeper, Frank Moss, playing in what was to be his last international, produced a number of fine saves to deny the Italians an equaliser, and Wilf Copping, England’s iron midfielder, took man of the match for his gutsy display in the second half. Although England had won the match, it was very close, with the ten Italians very nearly beating a full strength English team, but it was still enough for the FA to claim English default superiority over the rest of the world. The Italians claimed a moral victory as they had played with ten men for most of the match and their team is remembered in Italy as the ‘Lions of London’ for their fight back. One fact not in doubt was the sheer violence of the ‘Battle of Highbury’. Stanley Matthews remembered this as the most violent match of his career, and Hapgood said it was the dirtiest match he’d ever played in. The FA were so taken aback by the whole affair that they seriously debated abandoning international matches (by which it’s assumed they meant ‘foreign’, not ‘home’ countries).